Hello there! My name is Evie Reilly – the Vice-President Democracy & Creative Industries for 2017/18. The end of term may be fast approaching, but we at the Students’ Union have today launched our first All Student Vote of the year. The University is entering a period of restructure led by the Vice-Chancellor. As part of this, a 7% reduction in staff costs has been announced, with 50 to 75 academic staff posts at risk from across six departments. The University have claimed this restructure will not negatively impact student experience. A shortened version of the report given to Union Senate can be found here if you want to find out more. There has recently been scrutiny of the Vice-Chancellor’s salary, which totalled £423,000 plus benefits in 2016/17. Do you believe that there has been full and clear consultation with students on this restructure? Do you believe that cuts to academic staff will be detrimental to student experience? Do you believe that the Vice-Chancellor’s pay should be cut as part of the restructure? 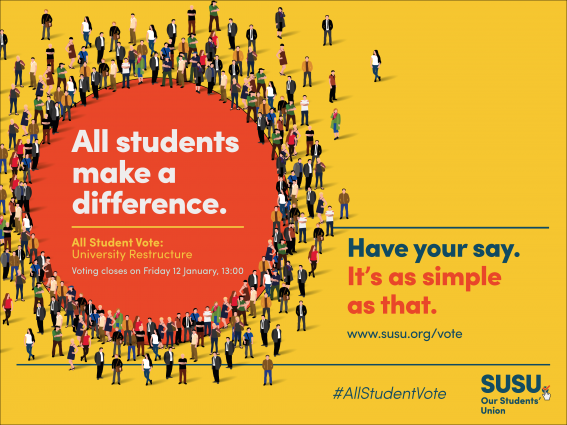 You can vote now until 13:00 on Friday 12 January, either online at susu.org/vote or at our physical polling booths which will be making their way around our campuses over the remainder of the semester, so keep an eye out for announcements of where these will be. If you have any questions or would like to know more, please get in touch with me either by email or on Facebook. Happy Voting!